When the Box Says ‘Protein,’ Shoppers Say ‘I’ll Take It’ | My Gospel Workers | "Redeeming the Time"
When General Mills Inc. wanted to introduce two new bars to its stable of snacks, it chose the same word to make them sell: protein. Protein is the buzzword that is helping sell many kinds of foods. Food companies are placing more prominent protein labels on packaging and adding protein to such products as drinks, bars and cereals. 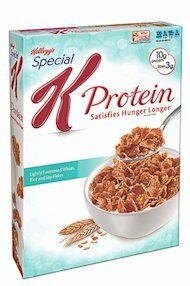 Protein is proving to be a powerful marketing tool for many food companies like General Mills. “It’s one of those rare things that has a lot of different meanings to a lot of different people and they are all positive,” says Barry Calpino, vice president of breakthrough innovation for Kraft Foods Group Inc., sellers of products from Velveeta to Planters Nuts. A mother believes food with protein will give her child energy before soccer practice and help her lose weight by making her feel full, according to consumer research from several large food companies including Kraft, Kellogg Co. and General Mills. An office worker sees an energizing snack that is better than candy at 4 p.m. A weight lifter sees a way to build muscle. They all see it as healthy. A label that says protein has what researchers call a “health halo effect” that goes beyond just the promise of protein. When people see the word, they also believe the product will make them feel more full or give them energy. Label trends change quickly, chasing the latest health headlines. In 2010, many food shoppers were wooed by product labels claiming to be free of high fructose corn syrup, according to data from Nielsen, a market-research company. Now gluten-free, hormone-free, and genetically modified ingredient free are growing. But companies see the protein binge as part of a larger trend of consumers increasingly considering their health when choosing foods. “Protein isn’t a faddish type thing,” says Mr. Calpino. Early this year Kraft introduced Planters Nut-rition Sustaining Energy mixes whose boxes boast that each single serving-size packet has 10 grams of protein. The company is also considering promoting protein on the front of packages of its cheeses and other products naturally rich in protein. In past decades, consumers responded to messages like “low fat,” “low sugar,” and “no cholesterol.” Now over half of consumers are looking for more protein and fiber for breakfast, Mr. VanDeVelde says. A product with protein in the brand name doesn’t need to contain a minimum amount of the nutrient but all food packaging descriptions must be truthful and not misleading according to Food and Drug Administration regulations. If a label says “good source of protein,” then the FDA says the product needs to have at least 5 grams of protein per serving. Silk created its Fruit & Protein drink to appeal to consumers looking for protein and juice in the morning, says a spokeswoman. The drink, introduced last year, contains 5 grams of protein per serving, one less than Silk Original soymilk because juice dilutes the soymilk, says Craig Shiesley, senior vice president of Plant-Based Beverages and Canada for Silk, owned by WhiteWave Foods Co.
Another example of the health halo effect: Shoppers often react to labels in illogical ways. When viewing foods labeled organic, consumers give those foods lots of other attributes like having fewer calories and being more nutritious, says Brian Wansink, a professor of consumer behavior and director of the Food and Brand Lab at Cornell University. Dole Food Co., the largest seller of fresh fruits and vegetables in the U.S., conducted a two-year study to find produce-package health claims that most appeal to consumers. People want to know more than simply what vitamins are in produce. “It’s ‘What does it do for me?’ ” says Chris Mayhew, vice president of marketing for Dole Fresh Vegetables. Last year Dole cauliflower started carrying claims such as “vitamin C, which helps slow the effects of aging” along with cooking suggestions. Other big concerns are healthy skin, healthy immune systems, mental clarity, heart health, strong energy levels and strong bones, Dole says. A decade ago, people generally associated protein with building muscle. As people embraced low-carbohydrate, high-protein diets, they began associating energy and feeling full with protein. Protein got a boost from Americans’ recent and seemingly unlimited love of Greek yogurt, often marketed as having more protein than other types of yogurt. In contrast to other common package food claims such as ‘good source of vitamins’ people say they can feel protein’s effects, says Jennifer Peterson, consumer insights director with General Mills. “Consumers will tell you they feel good, they feel they’ve had protein,” she says. General Mills recently introduced Nature Valley Protein bars, Fiber One Protein bars, and Lärabar Alt, a version of the Lärabar with 10 grams of protein. Much of the protein being added to products like drinks, bars and cereal is soy protein isolate—soybeans that have been processed to remove fat and carbohydrates. It is a relatively inexpensive way to get high-quality protein, says Joanne L. Slavin, professor in the Department of Food Science and Nutrition at the University of Minnesota and chairwoman of the protein committee for the 2010 Dietary Guidelines Advisory Committee. However, it can taste chalky. The “hard work is on R&D…making this stuff taste great,” says Joe Ens, vice president of the grain snacks business unit of General Mills. To create an appealing taste, the company loaded its Nature Valley Protein bar with nuts and gave it a chewy, not crunchy texture.